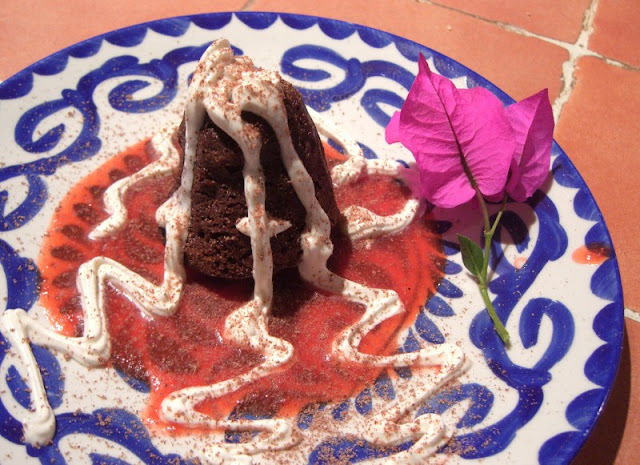 The star dish for our cooking class meal was Mole Coloradito Oaxaqueño. 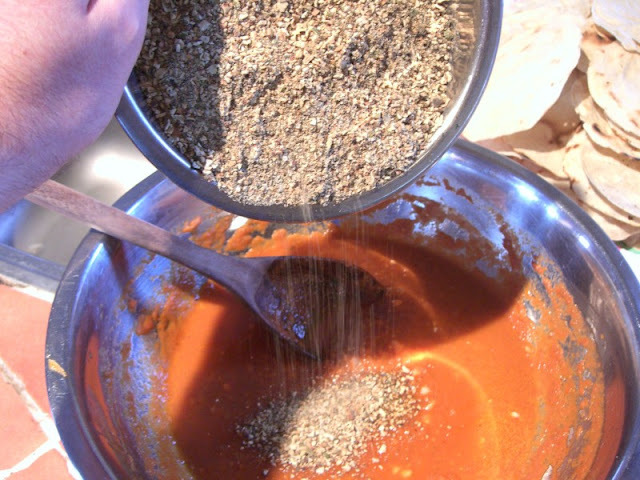 Above are the ingredients, and here are the chiles being run through a food mill after toasting and soaking. 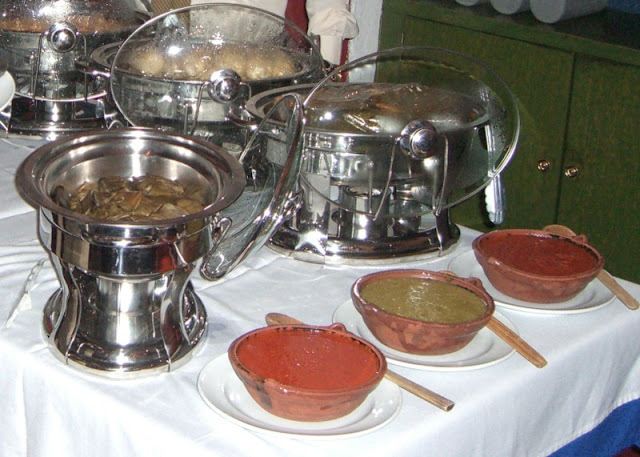 Soups are a very common part of a Mexican meal. We had Sopa de Ajo con Flor de Calabaza. Loads of sliced garlic was softened in oil making it very sweet and flavorful, clear chicken broth made the base of the soup. The squash flowers were very attractive and had a light, delicate flavor. 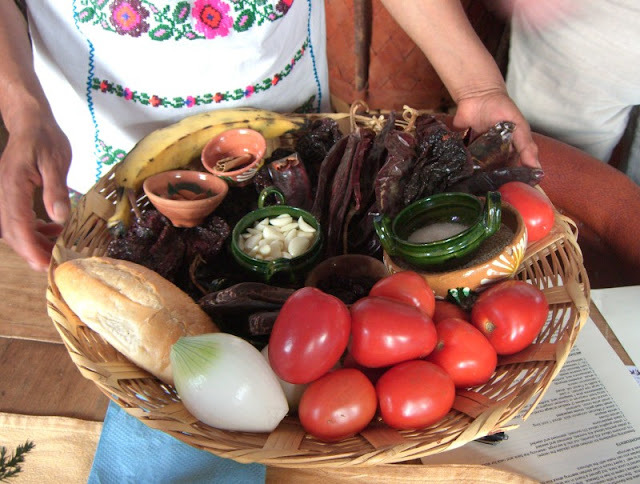 We also had a gigantic Ensalada de Verduras Asadas. 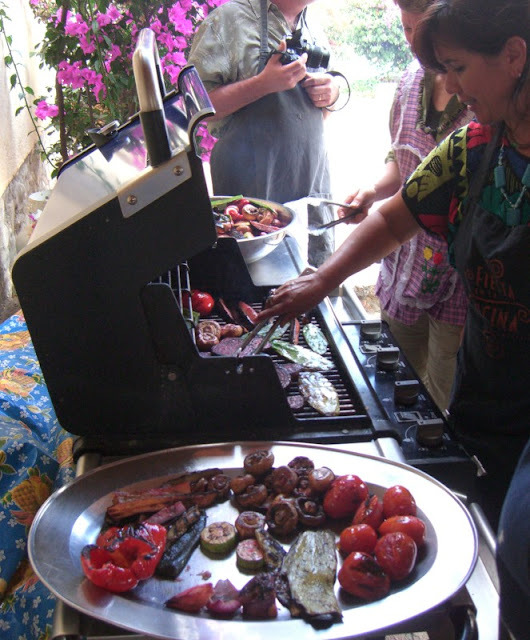 After marinating in a (not exactly Mexican) soy-balsamic mixture, the vegetables were cooked on the grill. 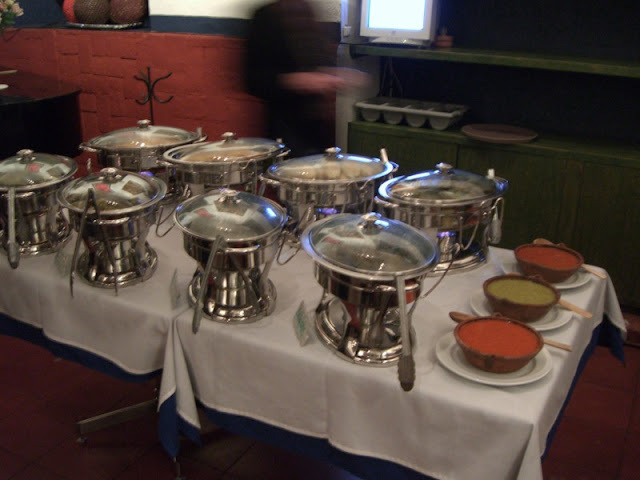 Along with the Pipián and Tetelas, it was quite the meal. 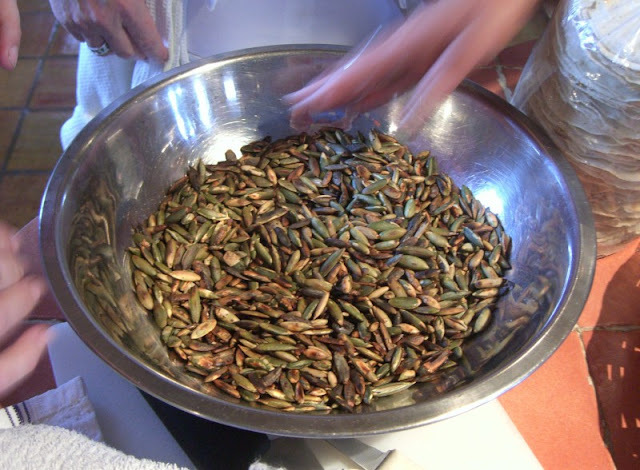 My favorite dish of the cooking class (not *just* because I helped make it...) was a "dip" called Pipían. 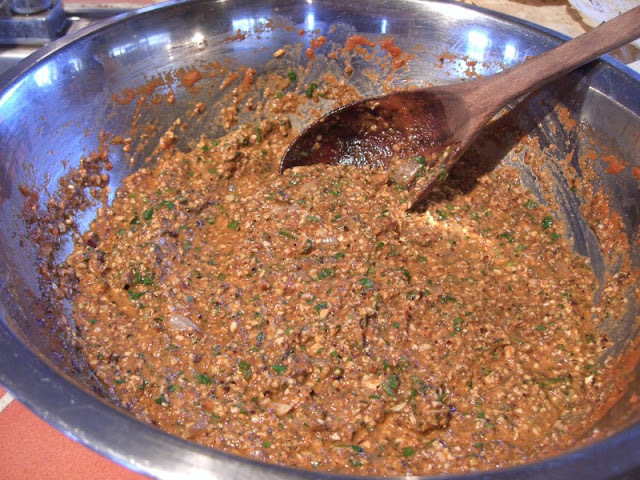 It is basically a salsa with ground, toasted pumpkin seeds in it. 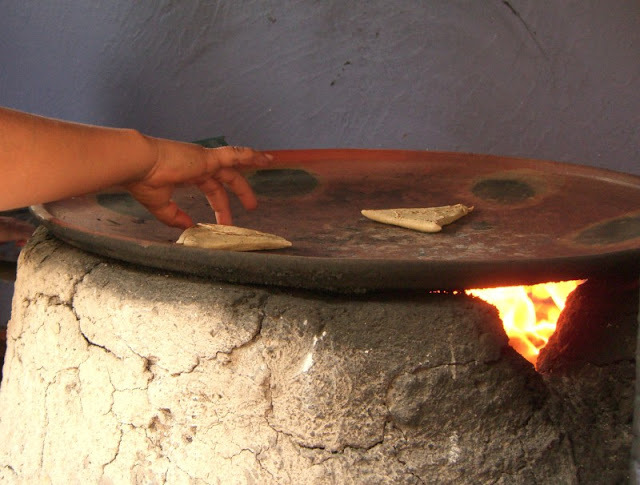 After the pumpkin seeds have been toasted on the comal, you pick out any that are too dark. 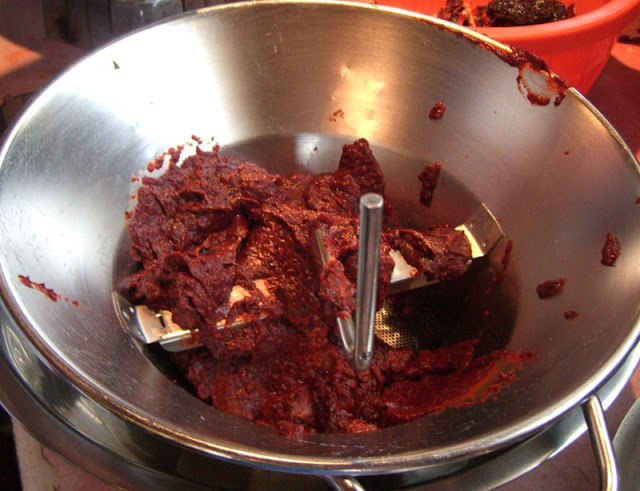 Once they cool, they get ground up in a food processor. 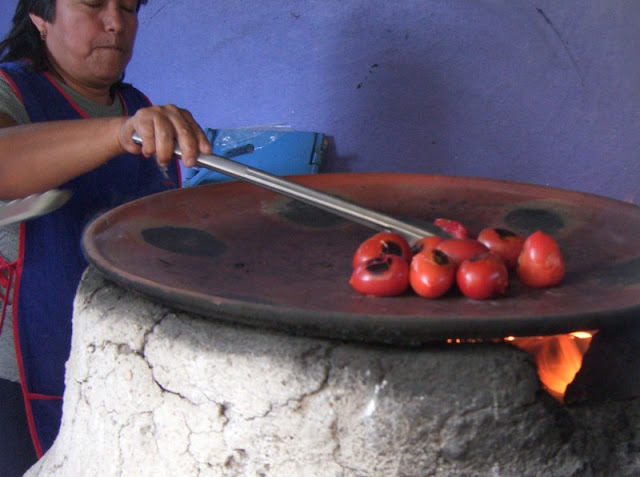 Tomatoes get roasted on the comal until they are nice and soft, and then get blended with a few pickled jalepeños. 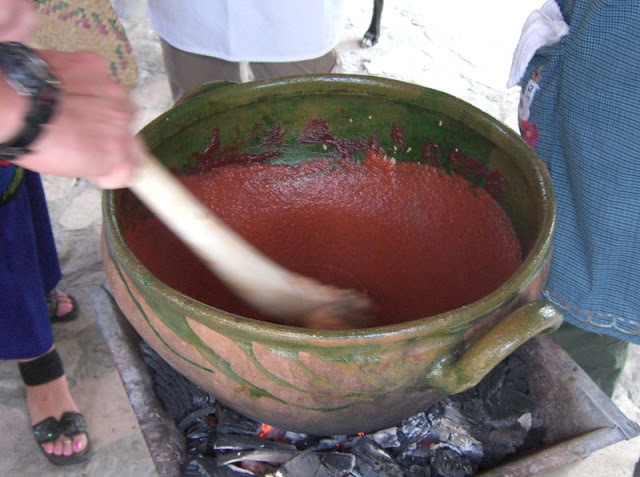 The tomato mixture gets cooked with some onion and garlic. 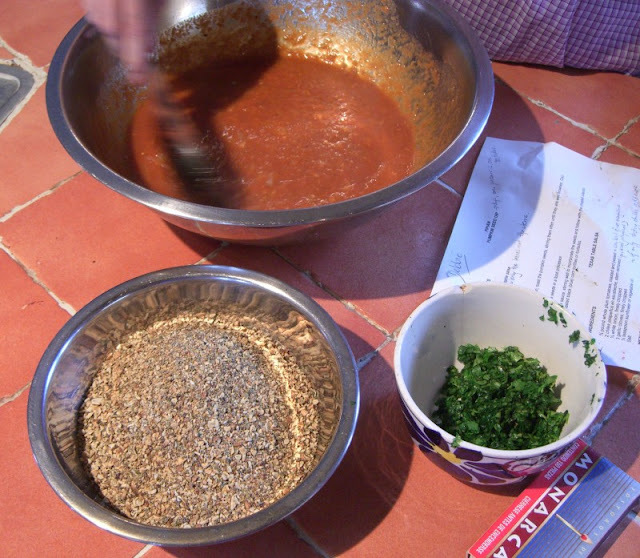 When everything has cooled, the ground pumpkin seeds and cilantro get mixed in with the tomato salsa. 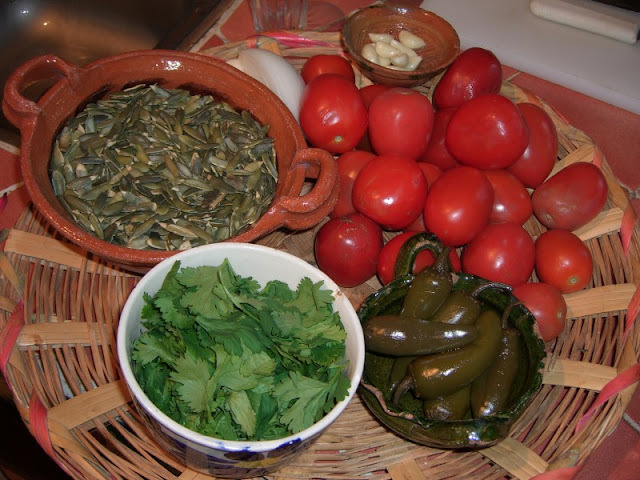 Spread it on some tostadas that have been crisped on the comal, and you have a great appetizer. We can't wait to make this again when we get home. 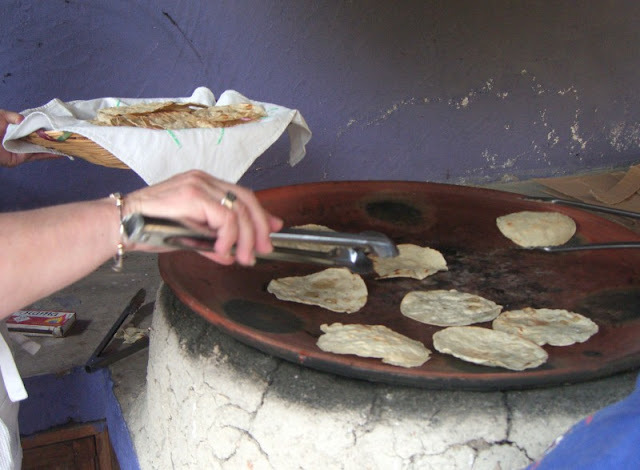 After our tamal stop, we visited one of the cheese ladies to taste the three major cheeses of Oaxaca - quesillo (the Oaxacan "string cheese" you get melted in quesadillas), requesón (a ricotta-like cheese), and, pictured above, queso fresco (the salty cheese they crumble on top of beans - my favorite). 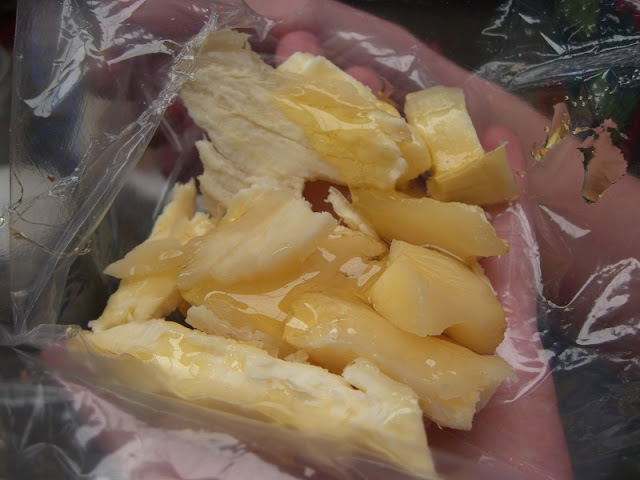 We tasted some yucca root that had been cooked, peeled, sliced and topped with honey. Yucca doesn't taste like much by itself (to me, at least), but it was quite nice with the honey. 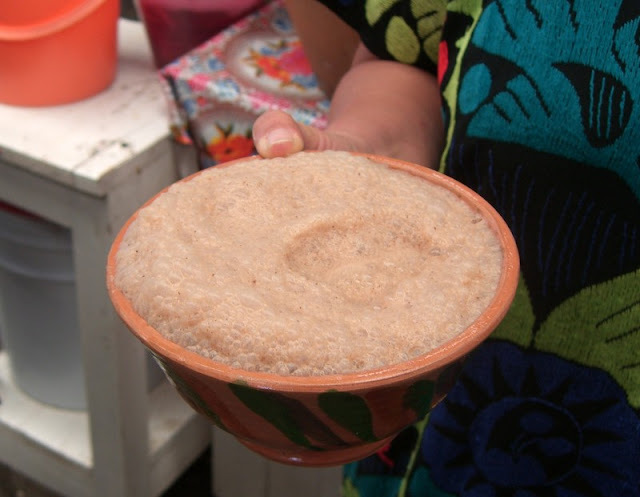 One of the more interesting things we tried was Nicuatole, a gelatinous dessert that is made from maíz. 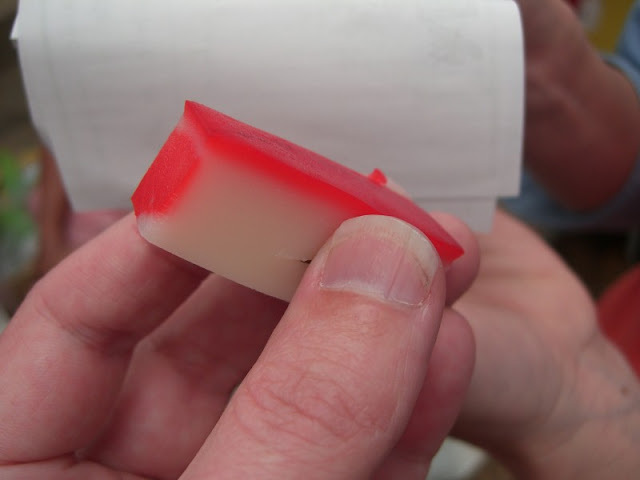 It tasted kind of like horchata jello. We've seen this ice cream making setup in a number of places now. 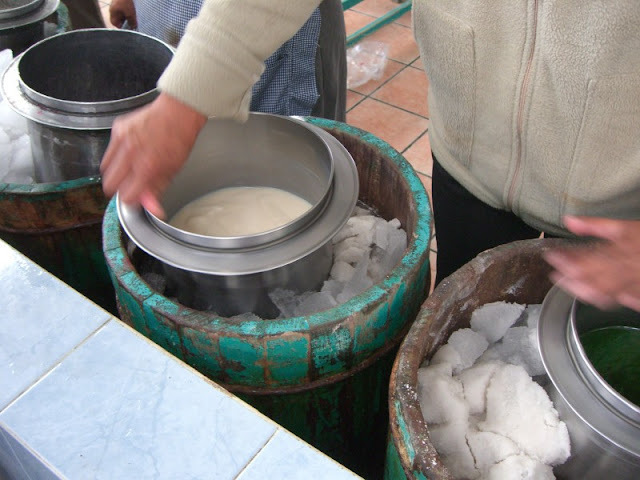 They have cylindrical metal containers full of the ice cream base, and they freeze it by spinning it around in a larger container of ice. The flavor in the middle apparently tastes like burnt milk. We didn't try it, but instead enjoyed what I think was a walnut or almond flavor, and one that was a basic custard flavor. 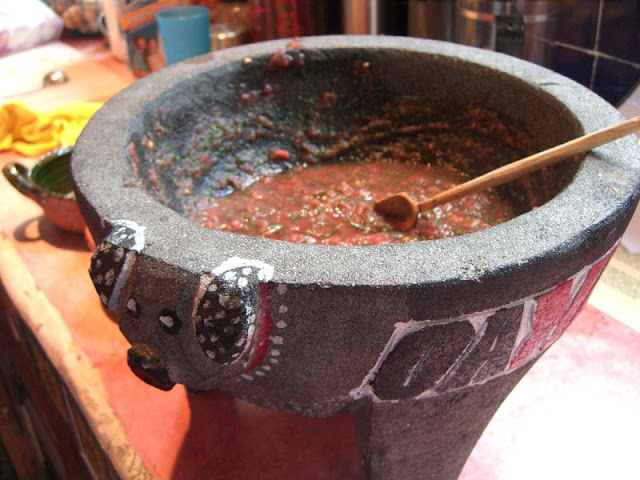 We shared a bowl of Chocolate Atole, a masa-based drink. The froth is supposed to be the best part. 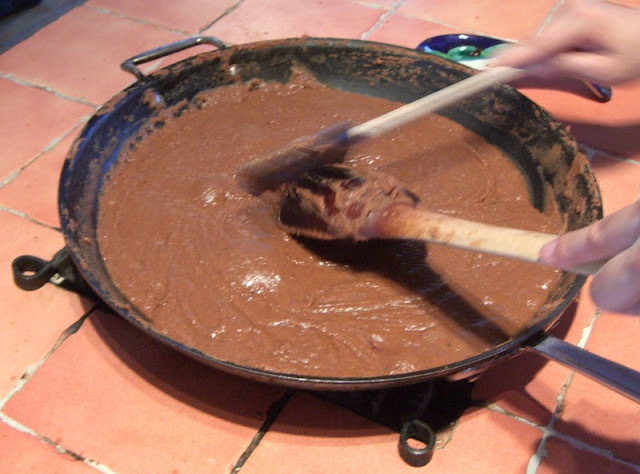 Wikipedia says it is the same thing a champurrado, but this version tasted quite different to me than the champurrado I've had. 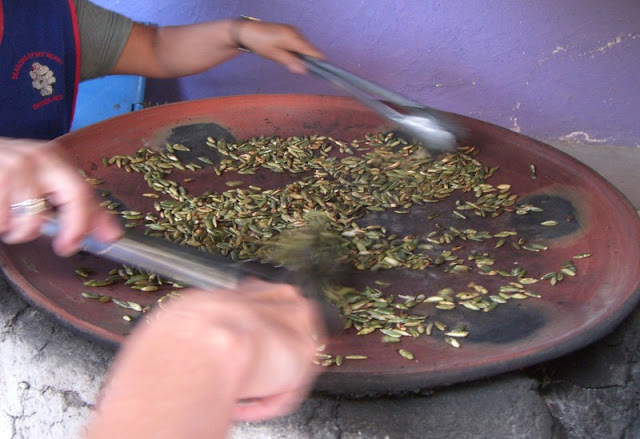 Another similar beverage we tried was Tejate, which is a very traditional Oaxacan drink made from, among other things, maíz and the flowers of the Quararibea tree. 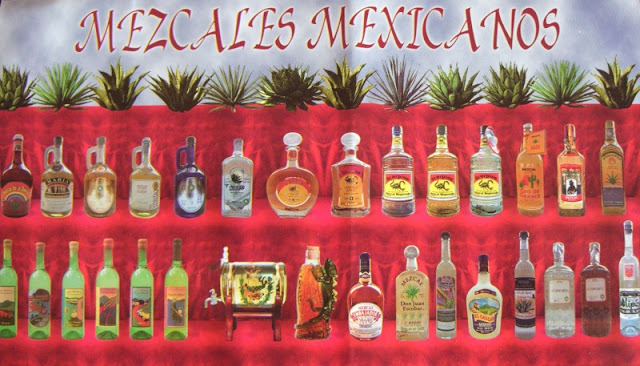 The vendor had a huge vat of it, and it was very popular with the crowd. 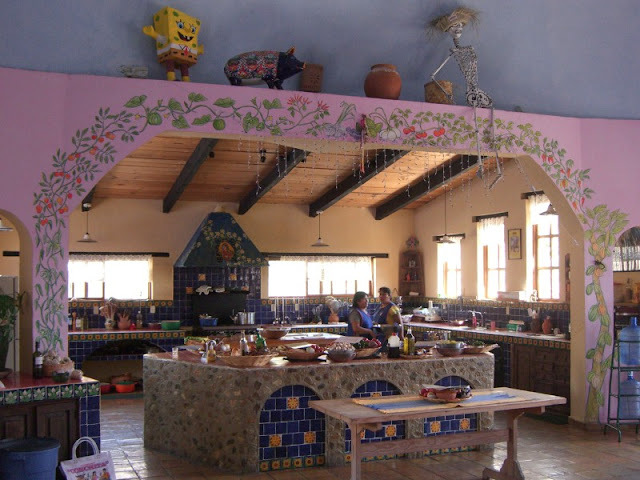 Even though we were already getting full from our tastings, we stopped in a fonda for lunch. 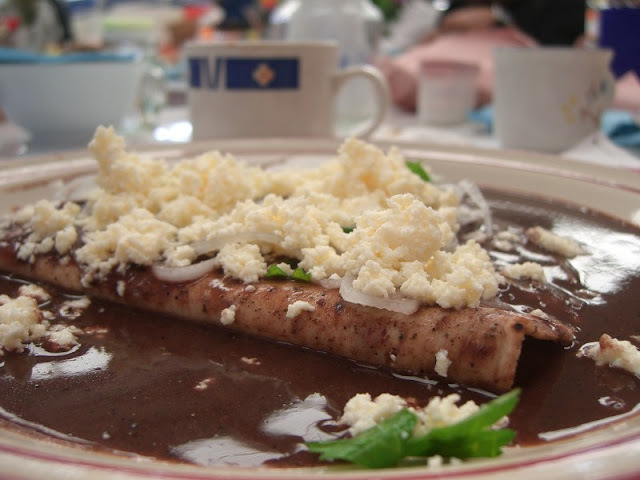 We had Enfrijoladas (basically corn tortillas folded up and then covered with a black bean sauce). 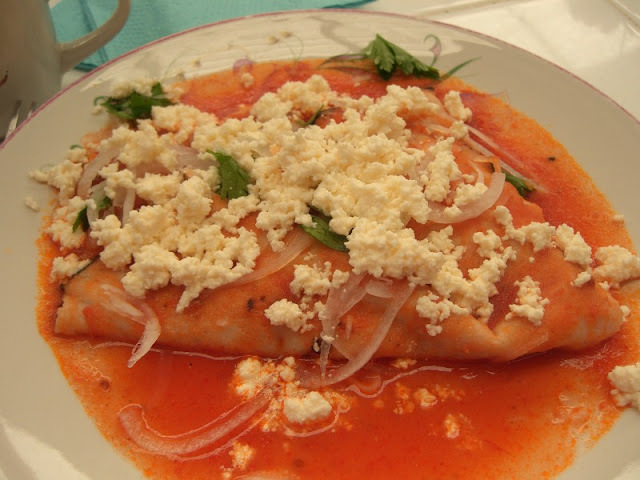 And Entomatadas (the same dish, but with a tomato sauce instead). 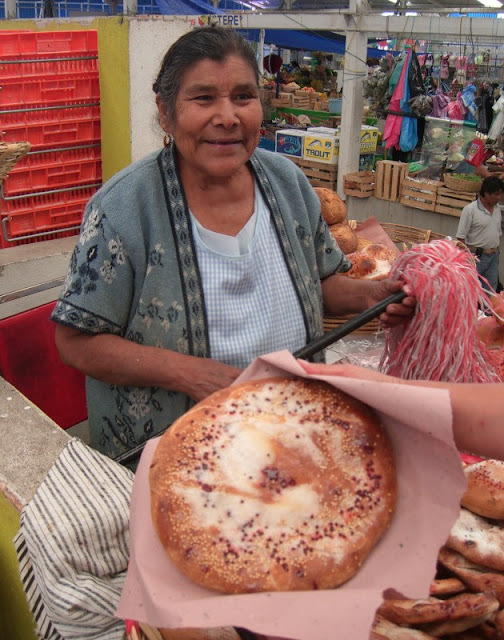 For dessert, we had a sweet Oaxacan bread. 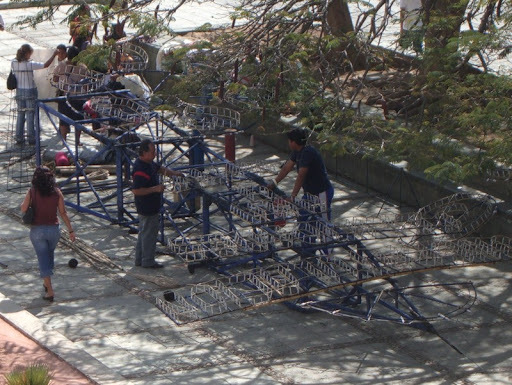 I'm not sure what it is called, but it seems quite common as we've seen it for sale from street vendors as well. 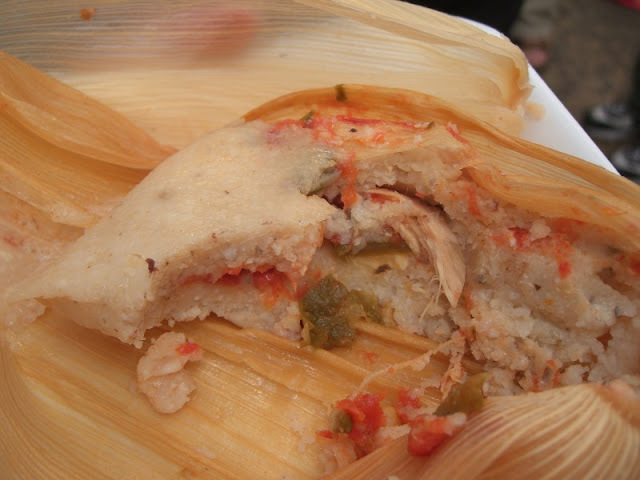 Our first tasting on our cooking school visit to the Etla market was a series of four tamales that were easily the best we've ever had. 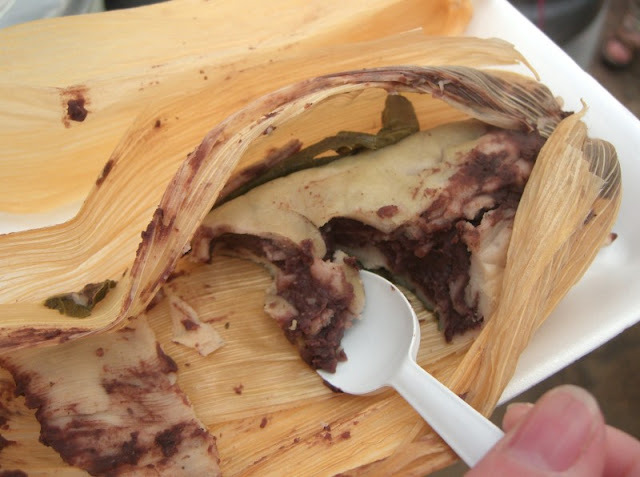 The first was a Tamal de Frijol - filled with a refried black bean mixture. The green bits you can see are Hierba Santa. 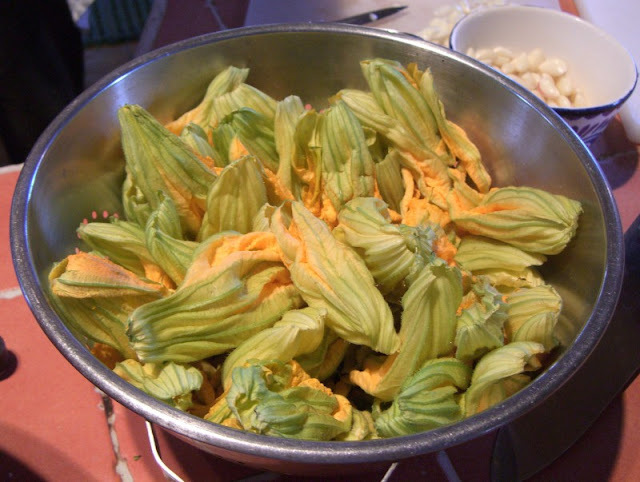 The next tamal was Flor de Calabaza (squash blossom). 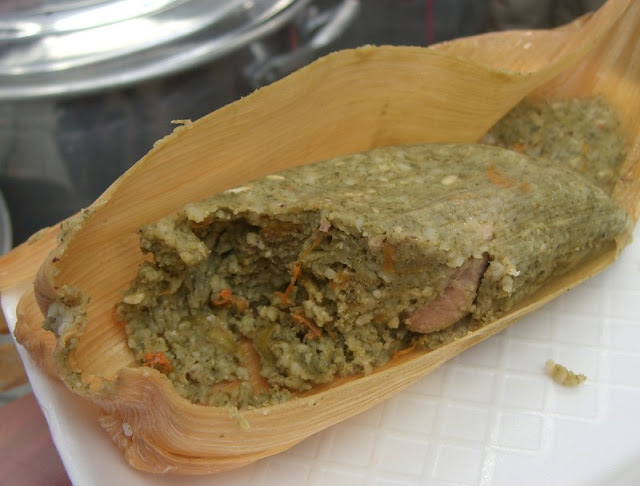 The entire tamal had a great green color, speckled with orange from the flowers. Some chunks of pork added a savory contrast. Up next was a chicken tamal with a tomato base. 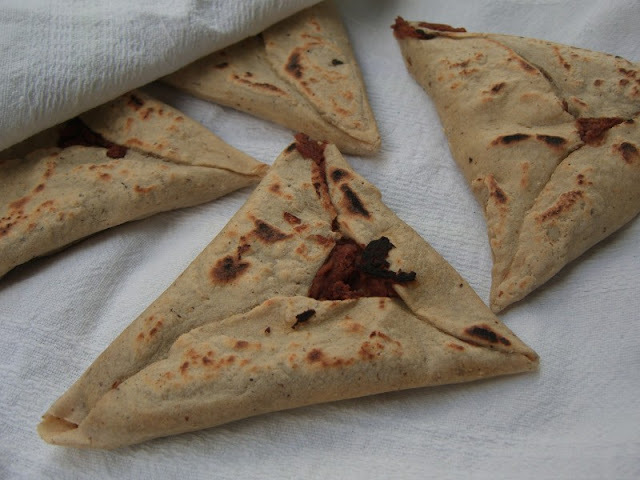 Simple, but very flavorful. 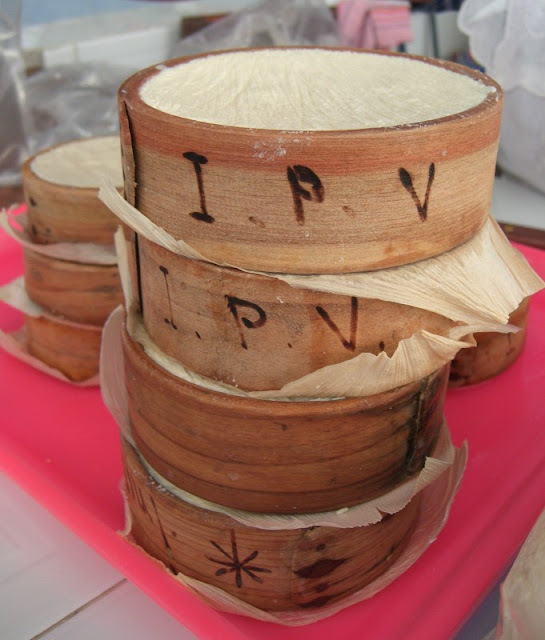 Interestingly, this tamal and the previous one used masa that wasn't a consistent fine grind. 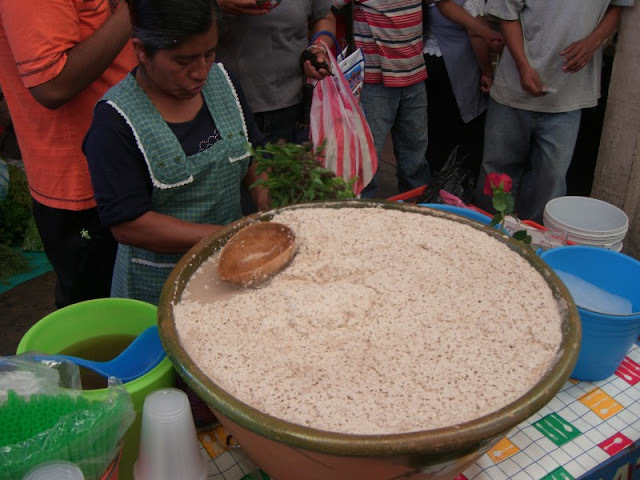 Instead, there were coarsely ground bits of maiz providing a texture we hadn't previously encountered - really nice. 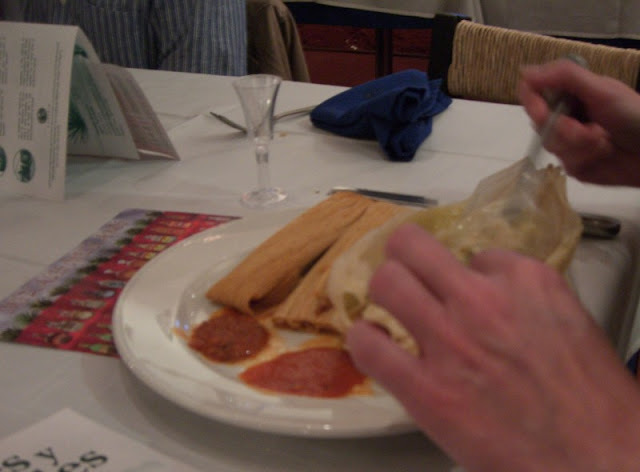 The final tamal we tasted was a Tamal de Mole Coloradito. 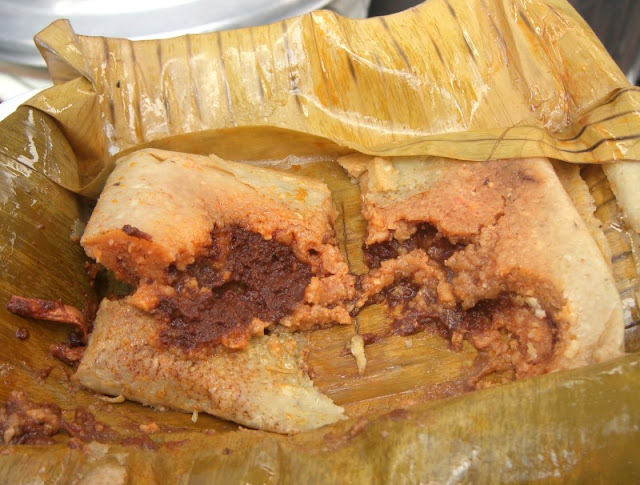 This one was a typical "Oaxacaño" tamal, wrapped in banana leaf with looser masa and a more saucy filling than the others. It had an incredibly rich intense taste. The vendor had two or three more varieties, but since this was only the beginning of our market tour we had to save room for later. 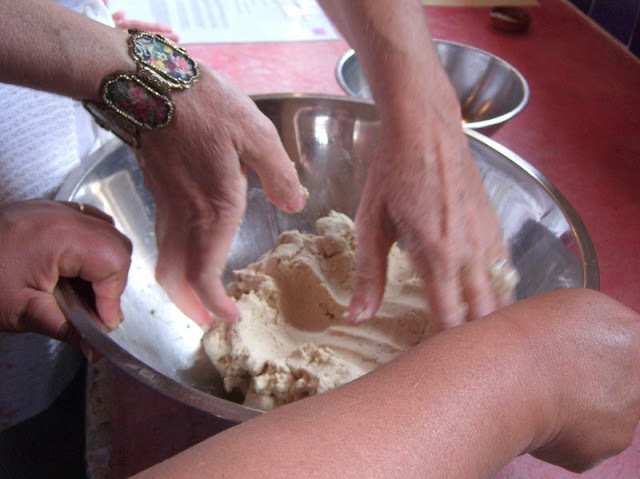 This past Wednesday, we had a fantastic day hosted by Susana Trilling's Seasons of My Heart Cooking School here in Oaxaca. 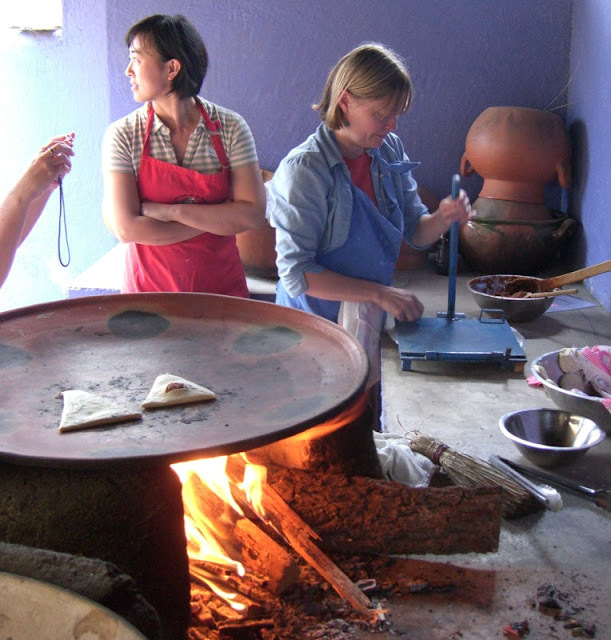 It was a Wednesday class because that is market day in Etla, a small town outside of Oaxaca that is near the cooking school. 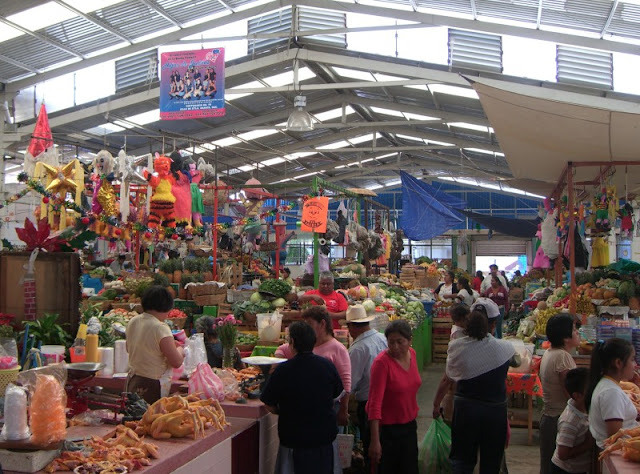 We started off the day with a market tour that was well worth the price of admission alone. 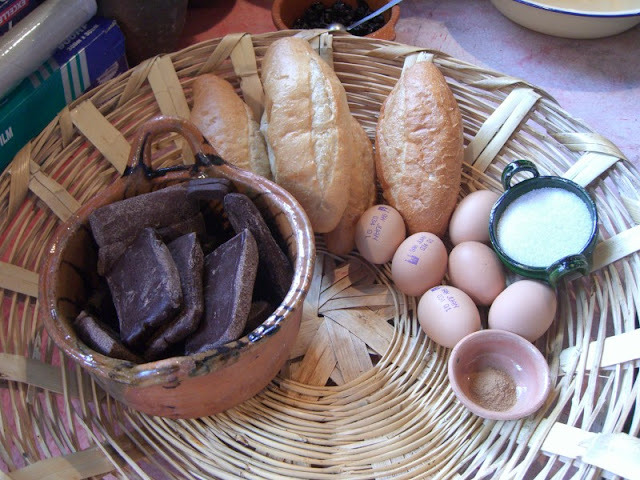 Susana was a wonderful guide, taking us through the market on a tasting extravaganza. 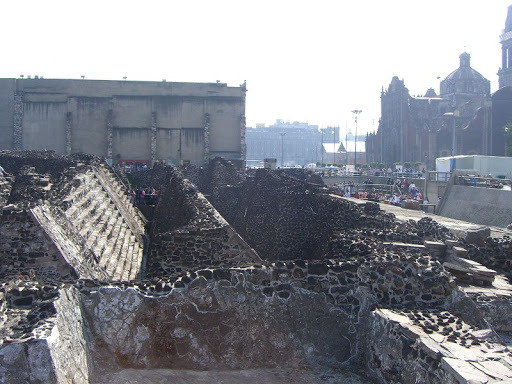 The Templo Mayor - ruins of part of the ancient Aztec city of Tenochtitlán on which Mexico City was built - is not that impressive compared to other sites in Mexico, but what is impressive is the location right in the center of the city. You can see the Catedral Metropolitana in the background, and past that, the Zócalo. 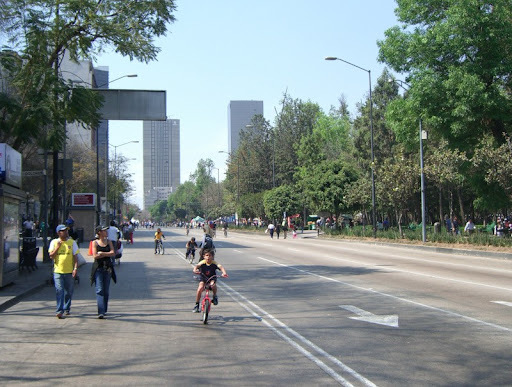 Seeing Avenida Juárez without traffic is quite a sight. They close down all of the roads around the central Alameda park for part of the day every Sunday, and people go biking and roller blading. 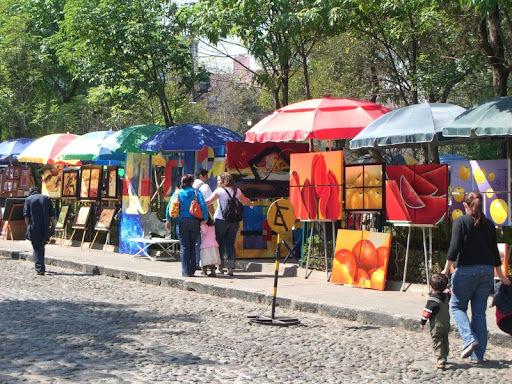 The beautiful, quiet neighborhood of San Angel has an art fair every Saturday. 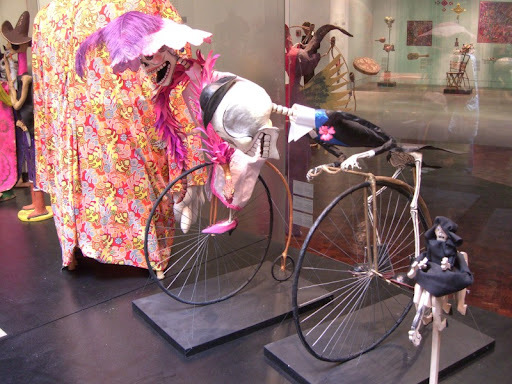 The Museo de Arte Popular has a great collection of modern Mexican folk art. 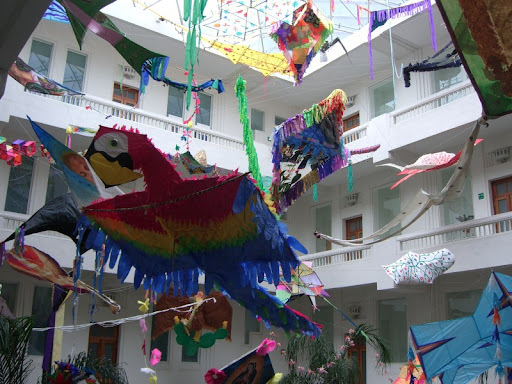 The courtyard of the museum is full of colorful kites. 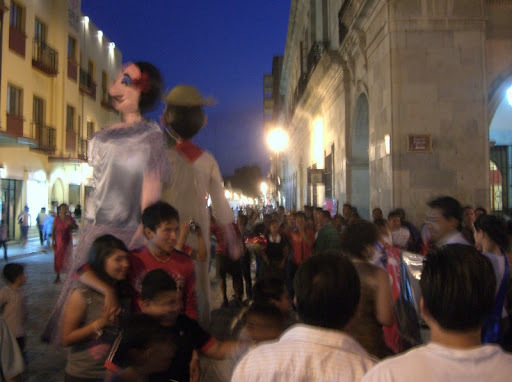 The exhibition of "Día de los Muertos" figures is particularly fun. Mexico city is full of dogs, but very few cats. 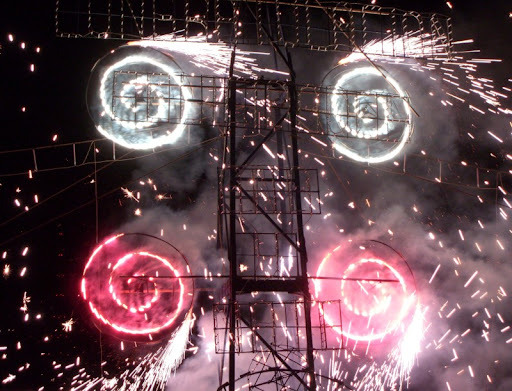 Maybe it is a machismo thing? 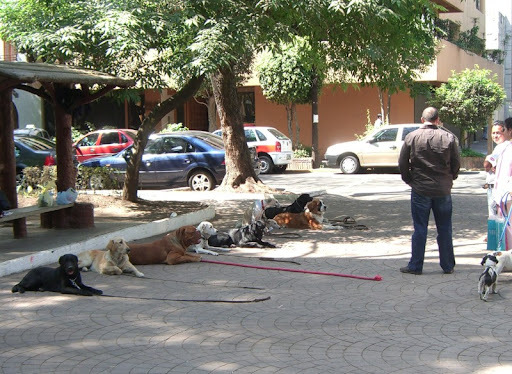 I ran into an obedience school in the park one day while wandering around the neighborhood of La Condesa. When not at school, the dogs are usually to be found on top of a roof somewhere. 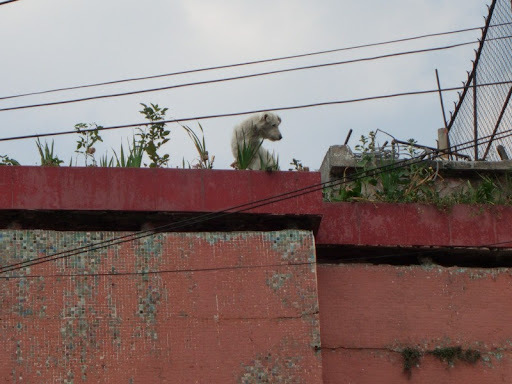 You know you are in Mexico when you spot "roof dogs". 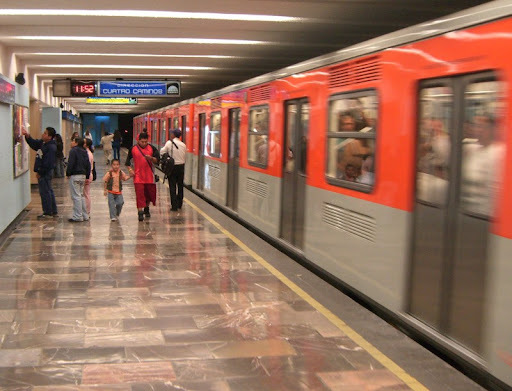 Public transportation in Mexico City is fast and efficient, if often quite crowded. At only $.20US a ride, the Metro is a bargain.